Earlier this semester, Belmont University Doctorate of Physical Therapy (DPT) students volunteered at the annual Sara Walker Run to honor a 2003 Belmont DPT alumna Sara Pigg Walker. The Sara Walker Run is a fundraising event to raise money for various missions supported through the Sara Walker Foundation that are intended to help spread Sara’s message of hope to others through Jesus Christ. Sara was diagnosed with stage 4 colon cancer in January 2011, on her 33rd birthday. After 16 rounds of chemotherapy and three clinical research trials, Sara’s earthly struggle with cancer ended in August of 2012, at the age of 34. During her life, Sara had two great loves: writing and bringing souls to Jesus. From January 2011 until her final breath, she sought to utilize her love of writing to provide encouragement to those who had their own struggles, always pointing her readers to Jesus. She candidly wrote of her physical, emotional and spiritual battles on her CaringBridge site, hoping she could provide encouragement to at least one individual. Her words went on to reach 700,000 readers, and her concept of “savoring” was especially touching. She frequently expressed the value of enjoying the little things this life has to offer and seeing each moment of this life as a gift from God. The first Run occurred in April 2011 when Sara’s ‘Belmont PT family’ sought to find a way to raise funds for medical expenses to help Sara and her family when she was diagnosed with cancer. Due to its huge success, and in an effort to continue to honor Sara, the annual Sara Walker Run continues today and serves as the Sara Walker Foundation’s main fundraising event. Christi Williams, 2005 alumna and associate professor in the School of Physical Therapy, Jennifer LaRocca, 2003 alumna and close friend and classmate of Sara’s and Sara’s sister Dinah Hall, also a Belmont DPT alumna (2006), serve on the Sara Walker Foundation Board with a focus of sharing Sara’s story and keeping her spirit alive in the hearts of Belmont PT alumni and current students. Williams shares Sara’s story with all incoming Belmont DPT students as she welcomes them into the ‘Belmont PT family’ and encourages them to help spread Sara’s message to others. Last year a “Battle of the Boulevard” competition was started between Belmont and Lipscomb student attendees. Last year, the trophy (a pig with angel wings) was awarded to Team Lipscomb. This year, there was a tie between the two schools so Team Belmont will house the trophy until next year. The competition will continue annually and the trophy will be passed between the schools, going to whomever has the most registered runners. Following the race, Sara’s father Jody (Papa) Pigg, with the help of student volunteers, led the kids in an interactive and fun worship service. 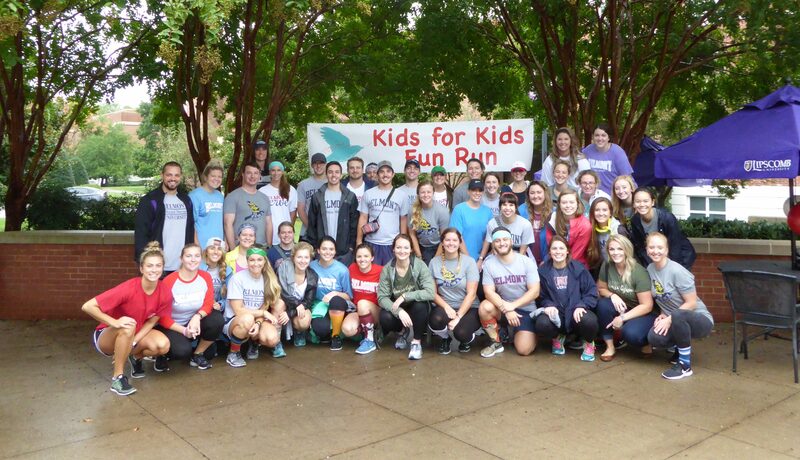 This year also marked the 3rd annual Kids for Kids Fun Run, including activities and obstacles designed by the Belmont DPT students. The kids were divided into 3 age groups and were given a wrist band that coordinated with their teammates. Each team was led by a group of Belmont DPT students while the other students created obstacles involving pool noodles, silly string, water balloons and more. To learn more about Sara’s story and the mission of the Sara Walker Foundation, click here. You can also purchase a copy of Sara’s book, The Light Shines Through – A Story of Hope in the Midst of Suffering.